Lidia’s love knows no bounds – especially when it comes to vulnerable children. 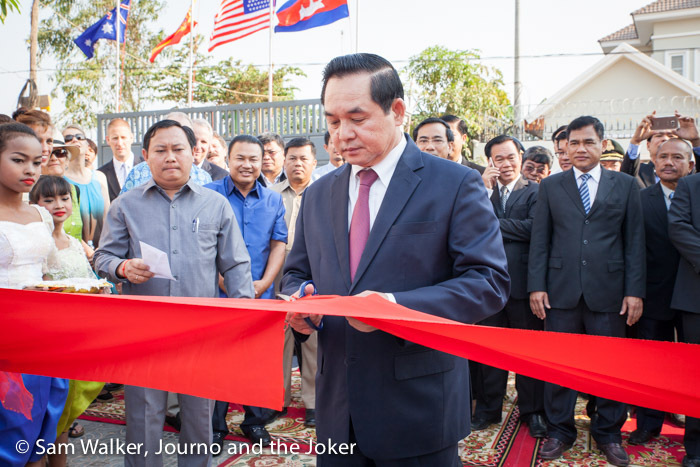 It’s hard to believe it is two weeks since we were at the official opening ceremony of Together for Cambodia’s new $830,000 facility, a home for at risk children, a school to be shared with the community and most importantly a place of love. I spent three days working as the official photographer — the two days prior to the opening involved visits to various grandparents the organisation supports along with the sewing workshop. It included a thank you dinner for the benefactors and a friendly game of football between the children and the visitors who have given so much support to the organisation. Then of course there was the ceremony, with all the dignitaries, including the governor of Siem Reap and about 1000 guests. Yes, it was huge. Huge! But the fact is, none of it would have been possible without the drive, tenacity, determination and huge heart of one woman. Lidia Linde Ginesta. Love, passion, compassion, commitment and an abundance of energy — these are just some of the qualities that sum up Lidia. This fiery, animated, strong Spanish woman who talks in rapid bursts and broken English, barely stopping to take a breath, is one of the most honest, driven and determined people you could meet. She’s an achiever. And a believer. She believes things can be done and she gets them done. She doesn’t suffer fools and she doesn’t bend rules. Perhaps the most remarkable thing about Lidia is that she has given up everything to be here. I’m positive she would tell it quite differently, believing she has gained everything from being here — and that’s certainly true. But it is not a decision you take lightly, choosing to move from your home country, on the other side of the world, give up your very successful, well-paying job and move to a third world country. It’s not a temporary move. It’s not just for a few years or even a decade, it’s a life-time commitment. Can you imagine? And it’s all for the children. Lidia, a former flight attendant, lived a care-free life travelling the world from one great dive spot to another before visiting Cambodia. And that one visit some seven or eight years ago changed her life. Perhaps more importantly it has forever changed the lives of dozens of children, a group of women and a growing number of grandparents. Lidia first arrived in Cambodia for a short stay and did some volunteer work. 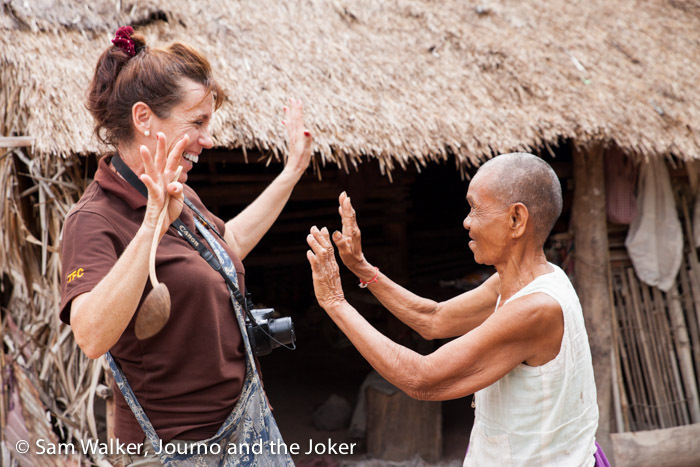 And like so many other visitors to Cambodia have found, the place kept drawing her back. Eventually she was spending two weeks in Cambodia and two weeks in Spain, coming and going in a whirlwind of work and children. And then things started to go a little pear-shaped. To be honest, I don’t know the full story so I can’t give you all the details. What I do know, is Lidia made the decision to move here permanently. She found out the children at the orphanage where she volunteered were at risk — the director of the organisation was accused of child abuse and the orphanage was shut down. Lidia suddenly found herself the custodian of more than 60 children. And she started Together for Cambodia. With nothing. No money. No home. She openly admits they were tough days. Dark days. Stressful days. Trying to find accommodation, trying to find food to feed them all. For the first few weeks they all — Lidia included — ate little more than rice. But fortunately, she had good friends who supported her from the beginning and slowly things started to turn around. She gets emotional and tears well when she tries to thank them. They know what those dark days were like. They know just how much work she has put in. When you look at where they came from and what has been achieved it is quite remarkable. From being practically homeless and scrounging for money for food, to this amazing facility. I don’t know of anything else like it in Siem Reap, or even Cambodia for that matter. The money for this dream was raised in about three years. It has come about because of some very generous supporters, who believed in the organisation and who trusted Lidia to guide it and to keep the children safe. Today, Together for Cambodia supports nearly 40 children and young adults. They were all at risk. Some were street beggars, some have been abused, some have been abandoned. None, she says, can be returned to their home or their family at this point in time, although she wishes that was not the case. Instead, she, along with her incredible team, has created a loving, caring, supporting environment where they are raising happy, healthy children with the world at their feet. Of course, they come from turbulent backgrounds and Lidia will be the first to tell you there are still issues to deal with for many of them. But they are given support and counselling. And much love. This centre for alternative care, this loving home, is not like so many of the orphanages you hear about. Lidia protects these children with the fierceness of a lioness protecting her cubs. These children are not tourist attractions and under no circumstances will they be exploited. Sadly, the same cannot be said of many orphanages in Cambodia and throughout developing nations. You can visit Together for Cambodia. You will be required to sign in at the gate. It is unlikely you will get to meet the children, but you can see the amazing complex TFC has created. It includes a building big enough to accommodate 120 children, a kitchen and dining complex, an administration building, a first aid or “compassion” building, a six-room school a $100,000 football field and a basketball court. Volleyball is soon to come. Under no circumstances will visitors be permitted to enter the children’s home. It is sectioned off and they have a separate, private entrance. Much of the expense in this amazing facility went into the things you can’t see. Landfill, so this former rice paddy doesn’t flood; drainage; strong foundations that mean the buildings can cope with another story being added in years to come, if that is necessary. The beautiful thing about this place — Dei Koma (the Children’s Land) is the children had a large part in designing and developing the centre. They created concepts, they helped check everything worked, they were given responsibilities and creative options. It is theirs after all. These children all go to private school. Sadly, the public school system proved too unreliable. Teachers often didn’t turn up and the children would be sent home. Outside of the Khmer school system they learn English and computers, some learn Spanish and they have a variety of activities they take part in to help encourage critical thinking and global understanding. Last year five of them chose to study for 10 hours a day so they could skip grades. All passed the necessary test. One of these dedicated young people has skipped from grade four to grade nine. What an achievement. I tell you all this so you can get a feel for the young people and the environment they are living in. Of course, they are not all academic achievers but they are given opportunities and encouraged in the fields that interest them. And it is largely under the guidance and leadership of Lidia. They are, she says, the next generation of Cambodian movers and shakers. They are the future of the country and she wants them to have the opportunity to make a real contribution. Most people see the serious side of Lidia. The planner, the organiser, always dealing with another problem, another question, trying to find a solution. And taking it all in her stride. But she has a remarkable sense of fun. Given the opportunity she will be out playing in the rain with the children, kicking up mud, throwing a ball, laughing and joking. I’m not sure how she fits it in, but she is learning the language — not just to speak Khmer but also to read it and write it. This language has the largest alphabet in the world. It’s a daunting task. While the children are Lidia’s main focus, she is passionate about the elderly. This group of people is often marginalised. There is no welfare system in Cambodia and old people without a family to support them or an income face extreme poverty and hardship. Lidia believes they are a vulnerable, often forgotten group, who need support. And she delights in being with them. 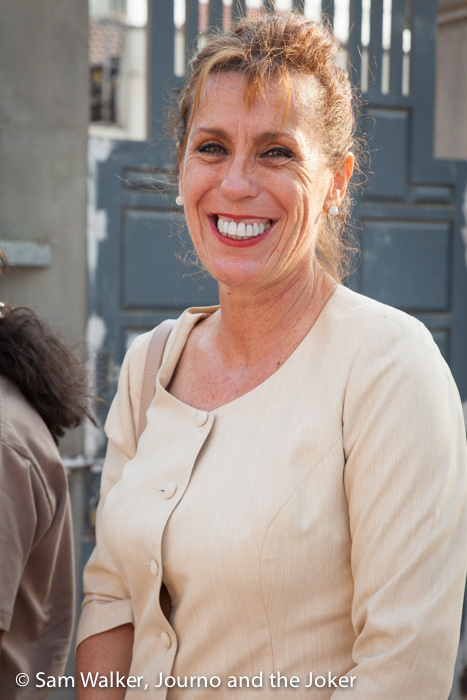 She has also become something of an expert on child safety laws in Cambodia and for women’s rights and labour laws. She is a strong supporter of everyone who works for the organisation and everyone is given the opportunity for extra training and the chance to learn new skills. She speaks in French to one of her drivers, who has also expressed interest in learning Spanish, she speaks in English or German or Spanish to her various benefactors. And always, she is prepared to answer questions. This vibrant, animated Spanish woman, who has the ability to talk your ear off, has a remarkable knack of making everyone feel welcome and special. She thanks everyone. Profusely. No matter how small you think your contribution, Lidia appreciates it. Even the smallest thing is worthy of huge thanks. Unlike some people who come for a short-time, make a contribution and go, Lidia is here for the long haul. This avid diver and lover of the ocean’s great mammals has moved to a land-locked, hot and dusty city. And it’s a permanent move. Yes, think about that. She plans to grow old here and calls Cambodia her country. She’s a lady with a big heart. And lots of love. Lidia is a personal friend, someone I’m honoured to call a friend. Her commitment is humbling, her energy is something to be envied and her passion is admirable. I’ve been working in a voluntary capacity for Together for Cambodia as needed, since June.